3-Color Heart Highlighter takes the boredom out of highlighters. 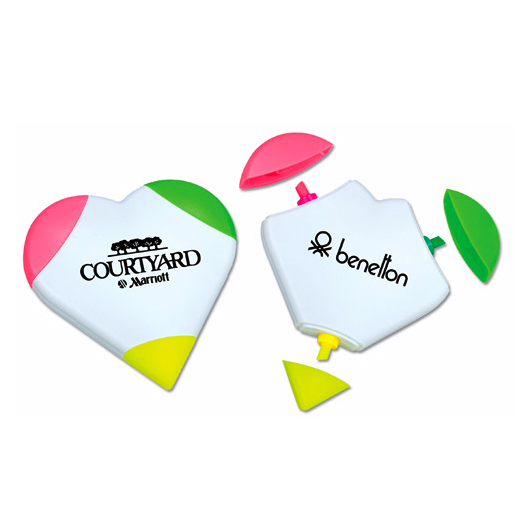 The 3-color Heart Highlighter makes an ideal promotional product for a wide variety of businesses, projects and events!This brightly colored editing tool features a heart-shaped white body and pink, green and yellow highlighters and caps. What a fantastic way to highlight your charity fundraiser or Grand Opening event. Ideal for college bookstores and office supply stores too. Add your custom imprint or logo and give a gift that warms the heart! Individual Poly Bagged / 26 lbs / 250 pcs.